Trained members of Victoria’s beekeeping industry are forming a key part of Agriculture Victoria’s precautionary response to the deadly varroa mite. The exotic parasite was discovered at the Port of Melbourne on 27 June. It is Victoria’s first ever detection of the mite which attacks bees by weakening and eventually killing bee colonies. Experienced beekeeper Bill Ringin was among the first industry members called upon. 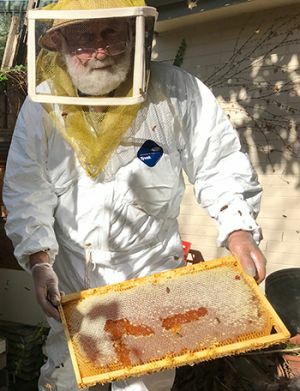 He is one of 140 Victorian beekeepers signed up, trained and ready to help as part of Agriculture Victoria’s Beekeeper State Quarantine Response Team (SQRT). The beekeepers work alongside authorised biosecurity officers in field teams to conduct in-hive surveillance, providing a crucial link between government and industry. Bill started beekeeping in Moe about 40 years ago. An electrician by trade, now retired, he has about 20 hives at his home. He harvests the honey from the hives, sharing most of it with friends, and occasionally lends his hives to friends who want to pollinate their fruit trees. He tests his own hives for varroa mite and other pests and diseases at least twice a year - and up to once a month for his main hives. “Australia is blessed to not have many pests and diseases compared with other countries. It’s the only beekeeping country in the world without varroa mite,” he said. “In other countries once varroa gets in, it’s very hard to get it out. That’s why you must be on top of it and be prepared for the moment it arrives – that’s our only chance at succeeding,” Bill says. “Right now, this is my opportunity to contribute - to do something to address this detection”. Bill completed his SQRT training five years ago after becoming experienced in detection tests such as the sugar shake method. Team members receive refresher training every two years. Agriculture Victoria’s recent Melbourne surveillance was initiated as a precautionary measure prior to confirmation of the detection to ensure minimal economic and agricultural impact. Alongside its effect on bee colonies, the mite can also transmit diseases, potentially decimating bee, honey and pollination industries. A confirmed incursion of varroa mite in Australia has the potential to cause a decline in the value of agricultural output by some $1.6 billion and directly affect about 9,500 jobs Australia-wide. To get the latest buzz on apiculture in Victoria, make a beeline for Agriculture Victoria.